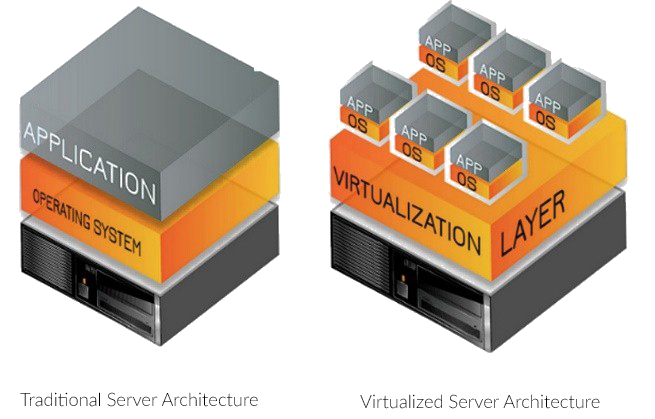 Virtualization allows for less physical hardware, such as servers, switches, and even firewalls. With less equipment, the number of cables will be reduced as well. New servers designed for virtualization are now equipped with 128 cores CPU in just a 2U size, it can host over 100VMs. As a result, the physical form of datacenters can be significantly transformed and reduced. For instance, it is possible to optimize a datacenter of up to 16 racks into a 1+1 iDCmini smart rack solution. Hardware optimization via virtualization allows for lower power consumption, therefore, your UPS can be trimmed down. Less heat is generated, and consequently, the requirement for cooling capacity can be smaller. The iDCmini has the ideal cooling solution for small scaled datacenters, while the iDC Air-38 allows for great scalability. Hardware costs are usually very high in traditional datacenters, reducing the amount of hardware used means that you can save on your costs. Moreover, there are other key benefits, such as lower downtime risk, easier maintenance, and lower electricity consumption. As a result, it can reduce the Opex (operating expenditure) significantly. Along with the efficient cooling systems of the iDCmini, your datacenter can achieve a very low PUE, cutting the cost of electric bills.